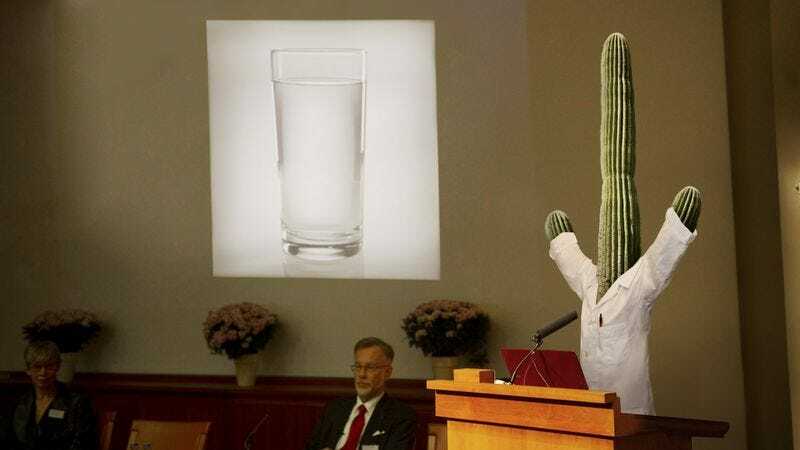 WASHINGTON—A consortium of the nation’s leading cactus doctors issued a new set of guidelines Thursday recommending that Americans drink at least 8 cups of water per year to maintain proper hydration. “Studies have repeatedly shown that, in the face of 110-degree heat and intense exposure to the sun’s rays, the average adult requires a full 0.2 ounces of fluid each day,” said 15-foot giant saguaro cactus Dr. Bronson Prickle, who also suggested the nation cope with its current record-breaking drought by using a widespread root system and specialized waxy layer of skin to retain as much moisture as possible. “Furthermore, our research indicates that protecting oneself against desert herbivores is integral to longevity, and can be achieved by maintaining tough external spines and unpalatable, bitter flesh.” At press time, a nesting pygmy owl was peering from an opening in one of Dr. Prickle’s many arms.